As the title says. I'm thinking of putting more river stones but with some buces glued on to them. So then there's a slope down leading the eye from left to right. But def looking to other ideas too. Esp since I'd need to get the stuff anyway since I'm out of supplies completely now. I actually like it it the way it is. Clean and classy. Maybe spread out Java Fern a bit more up and down the driftwood and/or add needle leaf closer to the left top to cover the heater / smaller Java Fern viriety closer to the bottom right. Is that a 4' tank? Why my house cannot hold more tanks? I'd plant the rock on the left, if you do put something on the right maybe Anubis's on the existing rocks, leaving some dead space. Yes it's a 4' tank. Thanks for the feedback everyone. I'll maybe put some shorter plants behind the driftwood arm that's sticking out on the right and see what it looks like. I tried putting some of the large rock behind the DW...But not enough space. It's a pretty hefty peice of rock. It's like 40 lbs. I do wanna get some skinny taller grass like plants to put behind that stone though. I kinda like it how it is also. I would agree with planting something on the rock on the left to get a little more height on that side, but i like the open look on the right side. Sort-of reminds me of a drop off in a lake. Thanks! I actually did order some vals. Should get here in a day or two. But I was kinda of thinking of sticking them on a weight vs putting them in containers...Can they survive off water column? No, they need rooted in basic sandy subrate. Why not just put down 1-1.5” of white’ish pool sand etc. Your tank would look much nicer also. 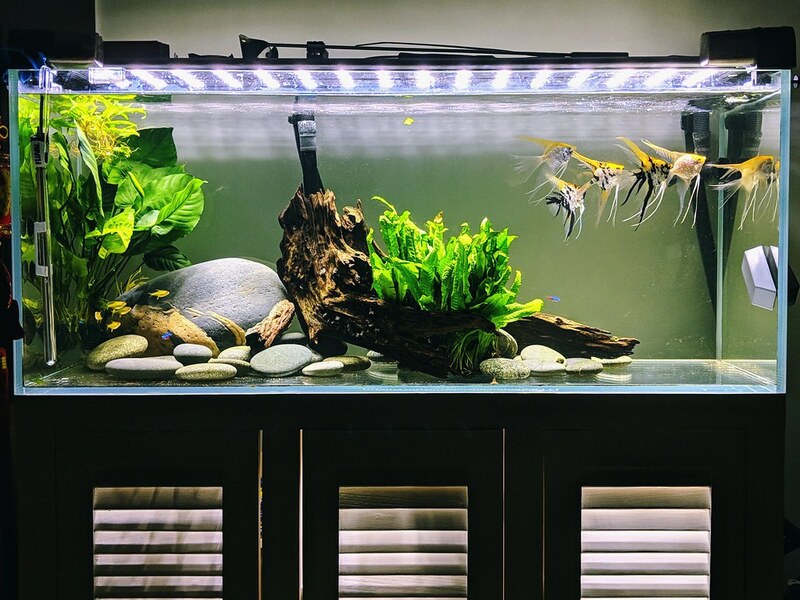 Im a fan of the more minimal look with the large river rock and right side of the tank remaining empty. If you can find it add some needle leaf java fern to the middle as its leaves are skinny and much longer which will move with the current. Don't think val can survive without a substrate, maybe? You could try finding a long skinny container or use multiple small pots to plant them in that fits behind the driftwood.